To strive for consistency is generally something desired and admired, however, it can become quite a rigid stance toward life. So this little post is in praise of inconsistency with a few provisos: Children need their parents to be consistent and predictable. Employers will not look favourably on employee inconsistency - nor will your clients, neighbours, mortgage holders, etc. Consistency is good - just not ALL the time. For example, think of the squeals of delight from little ones when they see a parent do something silly or goofy - out of character. Think of a brainstorming session where the desired solution/idea/invention comes from someone willing to think out of the box, make wild comparisons, speak the seemingly forbidden. So like Carl Rogers I say, yes let's generally be consistent, reliable - but not rigidly so. Someone who has access to all that they are - their creativity, their inner child, their unbounded joy, their spontaneity, their willingness to experiment, not know, look stupid - can express themselves freely without worrying if their current expressions jive perfectly with every past communication. You can expect to be called to account for being real, creative, unpredictable, quirky - but I think you will be pleasantly surprised that people will gravitate to you - longing to be as expressively free and unencumbered. I actually take being called "quirky" (and it happens frequently) as a compliment. Yes children need predictability, yet who loves surprise, cognitive dissonance or a conundrum more than a child? And aren't we all children at heart? 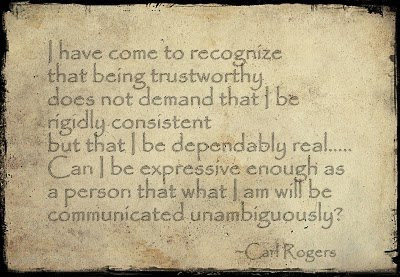 I love that this Carl Rogers quote shows we can be trustworthy, adult, competent, healthy AND at the same time freely, inconsistently, spontaneously expressive - able to express, reveal, disclose different facets of our personality. It makes me think of the old Marlo Thomas book for children called, "Free To Be Me". Do you feel free to be YOU, even if it reveals your inconsistencies? Bonnie, I live a life where consistency is the oil that greases the wheel. There is always something that goes off the scheduled coarse on a given day, so order is the order of the day! But I do know what you mean. I've mentioned before that somewhere along the way I lost the brake between brain and mouth, so I think I have become consistently inconsistent in what I will say! Bonnie, love this sentiment. Consistency, with a disclaimer. Yes, we try to be stable, consistent, and a rock and pillar to those around us that depend on us, but we also ned to bethe impefect human beings that we are, and realize that it is ok.
To break out of character and be silly or spontaneous is a good quality I believe and also good for the soul and for those that know us. Consistency, as is everything else is really all relative. So, I say we consistently be our imperfect human selves, and be happy about it. Thanks Bnnie, your posts are always short, sweet and packed with more punch than most long rambles I sometimes read. . .
Sandra: It is so true what you say - animals certainly need consistency from their human providers. A business or organization needs consistency 'for the wheels to run smoothly', etc. I think Rogers was referring to our personal expression as you suggest. Gary: Thank you so much for your comments. You know, I did have this post in reserve, but I am now wondering if it was seeing your post yesterday that prompted me to pull this one out of the hat. It was joyfully inconsistent. So thank you Gary, for the 'prompt'! Peeps - if you have not checked out Gary's blog, http://garyhellerphotograph.blogspot.com - you must!! He has posted some self-portraits that are not consistent with the debonair self he shares in his avatar. They grab your attention, make you chuckle. Fun, strange, inconsistent, creative, provocative. I try to not take life too seriously, so I tend to be a free spirit, children love me, sometimes adults think I am a little out there. Oh well. Great post. I couldn't agree more. Life is dynamic, and if we don't free free to change, roll and explore, we would be boring. We have many sides to ourselves - some nice, some not so nice. But revealing our quirks is really showing all of the sides that make us real. I have stuck to the "cleanse" consistently, which is totally inconsistent of me! So far, so good. In more general terms, though, I agree that a little inconsistency is a great thing in our sea of outside-influenced consistent behaviour. We have to follow the rules of society, law, employment, the road, and on it goes. Little bursts of inconsistent behaviour save us from becoming robots! So much creativity comes from inconsistency. You capture the advantages well. Humor especially. I remember Marlo Thomas from my childhood and the Paper Bag Players. How fun! I get called quirky too. I aim for dynamic authenticity. Sometimes that means surprising people, even myself. Sometimes that means paring away the old that no longer fits. And thanks for introducing me to Gary's website. Barbara: Many of us have fallen into 'formulaic' lives - but isn't it exciting to awaken or re-awaken the option of stepping off of the beaten path to enjoy a little spontaneity? Cinner: It's true - many would prefer that the free spirits be more predictable! Nancy: That's it isn't it - it's being real and willing to change. In fact, how could we ever change if we felt we had to be rigidly consistent? Sarah: I would guess if study were done, we would find the the inconsistent are consistently :) more creative. By definition, to be creative you have to colour/wander outside of the lines! You bring up another good point which is humour. What makes us laugh is when things are inconsistent. That's what makes a 'punch line' work is its very inconsistency. Kathryn: I was just thinking that an update on the cleanse would be a good post to follow this one. BRAVO to you!!! How are you feeling by having stuck to the cleanse? I hope it has produced the results Freston promises. I have followed the cleanse as far as the no sugar, no caffeine, no gluten. I have eaten no meat but I have had the occasional small piece of fish, a couple of soft boiled eggs, and white wine. So you were inconsistently consistent, while I was consistently inconsistent??? - something like that. :) After I had a bit of fish protein the numb, cold hand went away - but I have not experienced the boundless energy - perhaps you have to be consistent to get that reward!! I'm so impressed with your stick-to-it-iveness!! Meri: Dynamism is a word Nancy used too. Hard to be dynamic while being rigidly consistent. and also, much gratitude to you for your sweet comment on my post today...I did so appreciate seeing you again! Oh Bonnie, what a relief! I was always taught (or I just told myself) that to be inconsistent was on a par with being untruthful, or unstable, or immature. Not very positive at all. In things important I am consistent, but I do enjoy the fun that comes with being a little unpredictable and leave myself open to be flexible. More seriously, my children were badly thrown when I was no longer consistent in my values concerning marriage. It took an awfully long time and many, many discussions for them to come to an understanding of my about-face on the issue of divorce. While I haven't actually changed my mind that divorce should be avoided wherever possible, I just couldn't do it myself. It still bothers me that I betrayed something I had 'consistently' presented to them as a core belief. linda: Thank you for your comment - and for becoming a follower! It is true, isn't it, that often to become consistent we have to repress our joyful, spontaneous inner child. Deborah: Core beliefs change as we age. This is a fact of life. Values need to be reassessed. It takes time for our children to learn this. It is hard for them to accept in their parents. But again, it is a fact of life. I often tell clients that it can help to reframe a separation/divorce from looking at it as failure or betrayal to looking at it as the completion of a circle. It did not fail - it was complete ... and to grow it was time to move on. You came together in love to create and raise 3 children ... and as time passed and values, goals, interests changed, it became evident that what you came together for had been accomplished and completed. It was not a failure - it was a success that reached it completion. The betrayal would have been to stay together when the love had run dry or the values and goals had diverged. It never ceases to amaze me how distressed adult children are when parents separate. It seems every child wants their parents to stay together no matter what. It is a real step in growth and development for them to learn that not everything can remain the same, people change requiring circumstances to change too. It seems quite helpful to reframe separation and divorce from betrayal/failure into mission accomplished/completion. You accomplished what you came together to do and it was time to move on. Thank you for that, Bonnie. It's extremely helpful.